Facebook dating profiles will be an opt-in service and users will not be matched with people they are already friends with. For additional security, profiles will only include a user’s first name and will not appear in News Feeds. Those who choose to unlock the feature can view potential matches by checking out interest groups or events going on nearby. They can then browse the dating profiles of other users who are in the group or attending the event, and communicate via a private messaging inbox that will function outside of Messenger or WhatsApp. Shares of Match Group - the parent company of services including Tinder, OKCupid, and Match.com - plunged as much as 19% following the news. Shares of IAC/InterActiveCorp, the majority owner of Match, also fell 11%. Spark Networks, owner of JDate and Christian Mingle, also closed 4 per cent lower. But not all analysts believe Facebook’s success is a sure bet. "I can’t see Facebook supplanting Match any time soon – too big a moat," Benchmark analyst Dan Kurnos told Benzinga. "If you want a company that is great at getting people to like things, FB is for you. Aggregating all of that and matching people up based on common interests is not an overnight project, and requires a lot more than machine learning." 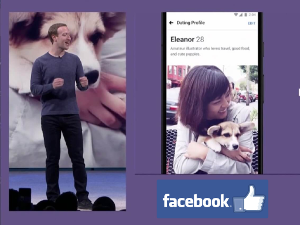 Facebook may have a long road ahead if it hopes to win over users who prefer to keep their social media separate from their dating profiles, but Zuckerberg believes the dating feature aligns with Facebook’s ultimate mission. "If we're focused on helping people build meaningful relationships this is perhaps the most meaningful of all,” he said. Once the new Facebook dating feature goes live we will update our Facebook Dating review with the latest information.